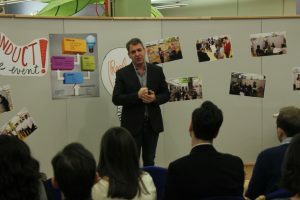 Innovative Evenings at the Innovation Loft - Innovation Loft | UNLEASH YOUR TEAM’S POTENTIAL! On Thursday, November 29th we held our latest Event Industry Extravaganza! Event industry professionals of all levels came by for a cocktail, a fun group exercise, and, most importantly, networking. Participants were able to tour the Innovation Loft to see what makes our space the perfect environment for an offsite corporate events and workshops; such as the movable walls, customizable digital screens, and an endless supply of collaboration tools. The sample exercises we created were cultivated from innovative thinking in order for attendees to get a sense of what our facilitation services are like. We were also lucky enough to have Howard Tiersky, CEO of FROM, The Digital Transformation Agency speak about how to plan, facilitate, and run a rockstar corporate event. He touched on the immense power of offsite events and how they can be the vehicle to the solution you are looking for. The reason to have an offsite workshop is to accelerate change through a collaborative vision and reach a solution to a current problem. Be sure to make the most use out of your workshop and always keep in mind that the biggest investment in any workshop is people’s time away from their day to day responsibilities. Always focus on the outcome. Set a goal and keep working towards it. Engage with your participants! Change doesn’t come from an uninspired group. Provide your participants with information about the overall purposes and objectives of the event. The environment should promote creativity and collaboration as well as be interactive to keep attendees stimulated, engaged, and moving around the space. Have a clear and concise (but flexible) agenda to keep you on track. The offsite wasn’t a dream so don’t treat it like one, document the work done during the offsite and be sure to follow up with one another to not lose the progress you made. Thanks to all of you who came out and made the networking event a complete success! We look forward to seeing the rest of you at our next event! Visit Planning An Impactful Event to read about how these event industry experts plan their various workshops and offsite sessions. 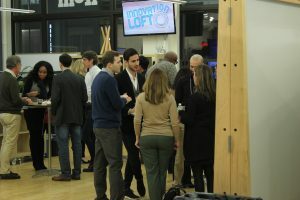 If you have any other inquiries about our space or services, please don’t hesitate to email info@innovationloft.com or give us a call at 646-692-3522.